He thought the suspect he was chasing a drunk driver, but according to police, a 13-year-old boy took his dad’s girlfriend’s car late on Saturday night and went on a wild joy ride with his 8-year-old sister. The policeman was told to keep on the lookout for the black Nissan Altima that was driving erratically. He eventually came across the vehicle, flashing his lights to get him to pull over. You think at this point, game over, he’s had his fun. But ohhh no. 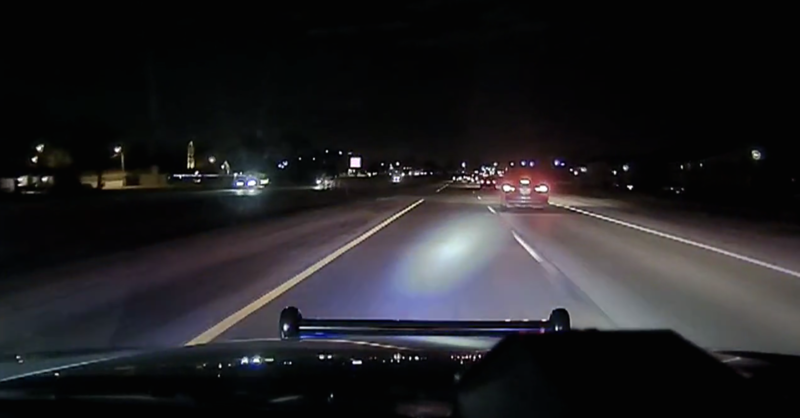 When the officer gets out of his cruiser the teenage driver speeds off, swerving and weaving his way through the traffic, like he was playing a driving game. At first, it looked like he might get away but then he goes off-road and completely loses control before crashing it. Fortunately, no-one was injured, but after losing control of the car they both fled on foot. Eventually they were both cuffed by officers- the girl was returned to her mum and the boy sent to a juvenile justice centre.